CUTTING edge cancer equipment costing millions of pounds has begun arriving at the new radiotherapy centre due to open in Derry this autumn to treat patients from across the north west including Donegal. Altnagelvin Hospital took delivery at the weekend of two of three TrueBeam linear accelerators (Linacs) with the final one expected to arrive within the next few days. The ten-tonne machines, which are the size of a large van, are "some of the most advanced" currently available in world cancer treatment. They will help improve outcomes for patients suffering a range of cancers including prostate, lung, breast, gastro-intestinal and head and neck cancers. The machines work by targeting cancer tumours "with pinpoint accuracy". The radiation dose is then delivered up to four times faster than was possible with the previous generation of radiotherapy equipment. Three world-standard linear accelerator machines have begun arriving for installation at the new cross-border radiotherapy cancer centre due to open at Altnagelvin Hospital, Derry, this autumn. 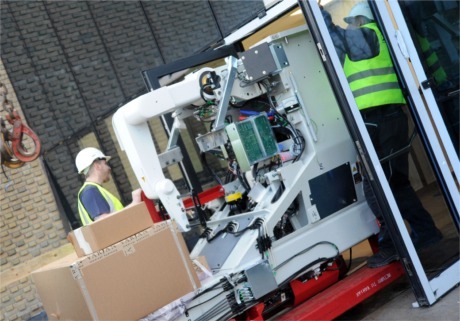 A team of ten people will be required to manoeuvre the units in five large pieces from a lorry onto a platform and then into a temporary opening at the side of the new radiotherapy facility. Head of radiotherapy physics at the Western Trust, Dr Andrew Reilly said: “Installation will take about six weeks and then a number of months will be required to complete the detailed testing and configuration necessary to prepare the machines for treating our first patients in autumn of this year. Radiotherapy services at Altnagelvin Hospital will provide cancer treatment for patients from the entire Western Trust area, and from Coleraine, Moyle, Ballymoney and Donegal. It will be available to a population of over half a million people living on both sides of the border.